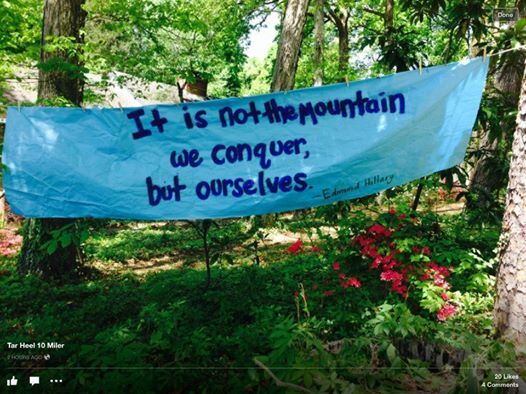 I love whoever lives in that house, and comes up with those inspirational literary-based banners. I wish I could meet them. I am a planner. I am a problem-solver. I like to be in control — not over everything and everyone, but over aspects of my own life that are important to me. Maybe this is why I love running so much, because I like the feeling of control I have over my body when I run. Of course, bodies can fail, and things happen, but compared to other aspects of my life, running affords me at least the illusion of control. 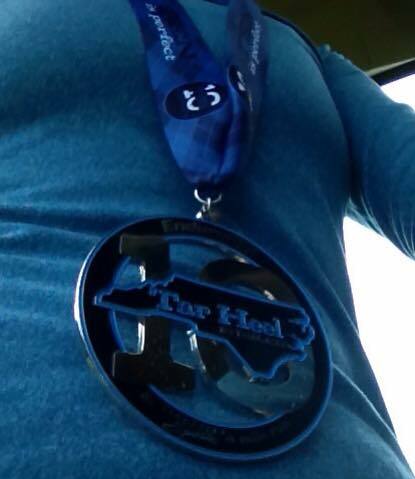 This past month I registered for a full marathon to be held in November and a half marathon in June, and I ran the Tarheel ten-miler last weekend, as I did last year. After I hit ‘submit’ on the registration form for the 1/2 in June, I thought about why I felt compelled to register for that race, when I had told myself no more races until the end of August. Maybe it’s because I need the challenge. Maybe I need a race I can be more mentally prepared for, to make up for how mentally difficult running the ten-miler was last weekend (sleeping fitfully in a tent at a grassroots music festival the night before a long race is something I won’t ever do again). It could be connected to the fact that some areas of my life feel out of my control right now, so I struggle to regain a sense of autonomy over a part of my life I feel I can control. There is something so satisfying to me about all the weeks and sometimes months of training culminating in the excitement of a race. To get that medal at the finish — that tangible symbol of the hard work, is worth the pain it sometimes takes to get there. I can hold it in my hand; weigh it, and show it to others. It makes the hard work real. I thought a lot about my writing career during the race, because thinking about words, in all stages of their development, is one of the best ways I know to take my mind away from how many miles I’ve done or are left. I thought about the book I’ve written, and how it seems to be floating in some kind of purgatory, its fate still to be decided, its characters in some murky place between existence and non-existence. Because, without readers, how is a story told? How do characters live, and breathe, and grow? I think about the book that I am writing now — characters ephemeral still, like the half-developed images we used to make for kicks in my high school photography class. I imagine a book — my book — in my hands one day. I feel the weight of it. I turn the pages. Sometimes I scold myself to stay grounded, and to stop getting ahead of myself; after all, so much of the journey towards publication is out of our control. Other times I allow myself to be carried away, faster than my feet, by the fantasy. Those times are rare, and happen only when I am running. Why? Because when I run, that’s when all dreams feel truly possible. Those words came by way of a student from last semester, who wrote about that quote — handed down to him from his dad — in an assignment modeled after the “This I Believe” archival oral history project featuring inspirational essays and stories. Those words are a legacy passed down from father to son and, pat and cliched they may sound, they are all that young man has left of him. They are catchy on their own; in the context of his story, they are truly transformative and empowering. Lately, my running life has been informing/transforming my perspective on my writing life. Out on a run last week I received some news that was part-setback, part-huge-step-forward, and on my way home I turned the corner to the road back and found it blocked by massive tree-service trucks. I stopped for a minute, stupidly defeated by the blockage, and the guy in the orange vest who waved frantically at me to turn around, until I realized I just needed to take the other road — longer, and more hilly, but still a road that would take me home in the end. See? I told myself heartily while I chugged uphill. Roadblocks are just temporary. Sometimes the road to what you want is not as straight and easy as you think it should be. This weekend, when I was out on a training run for this year’s Tarheel ten-miler, the image of that banner flashed in my mind again. I was thinking about the crazy roller-coaster year (no, past three years) it’s been for my writing career, and how where I am now in the journey feels like my Mile 8 — over, and over, and over again. I don’t want to be the runner doubled over by the side of the road, and I don’t want to be the one stopped, hands on hips, while I watch everyone else conquer their own personal mountains. I want to be the one who makes it all the way up the hill, and down the other side. 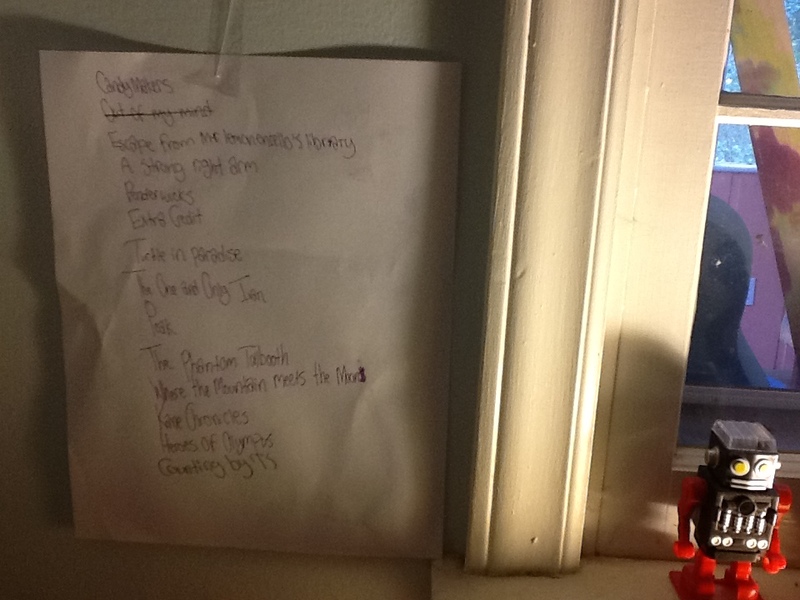 My daughter made me this reading list. I don’t read enough MG, in her opinion, and she’s set out to right that wrong. I read a lot. This shouldn’t surprise anyone who knows me. I go through binge-reading spurts, where I can sometimes read a book every two or three days. I love the feeling of having a “book in the wings” — something waiting for me when I have a few free moments. I am addicted to the thrill of dipping my foot into another place, spending my time with new people, and being pulled along by a narrative. Back in college, I used to think that I couldn’t read while I was actively working on a piece of creative writing. Reading while writing filled me with a sense of self doubt so crippling that it stopped my creative process in its tracks. Thank goodness I grew out of that, or I’d either be spending my time a) not reading or b) not writing. Now I can happily do both. My kids are big readers, too, but my daughter far surpasses my son in the sheer volume of books she can read in any given month. I don’t think a day goes by when she isn’t in the middle of some novel. She also knows quite a bit about what works and doesn’t work for her in a novel. She will peer over my shoulder when I am writing and ask me whether or not I really think it’s a good idea to start my book with that POV, rather than with the other main character’s, or if I’m planning on writing about x, y, or z (she was the first person who had to suffer patiently through a long and rambling account of what my next book will be about). If I am busy I will sometimes brush off her advice in the moment but then it comes to me later. Was I planning on writing about x? Why not? Should I start from that POV, or would it be better to start another way? I’ve been thinking a lot lately about how so much of the writing process is not — and shouldn’t be — a solitary pursuit. The actual writing part is, of course. But there is so much behind-the-scenes work that goes into writing that is far from being solitary. Reading, for example, a critical part of writing, is more fun when you get to share a book with someone else. Each time a person raises a question (or two, or even a dozen) about something written (either by me or someone else), I can feel my brain flickering, making sense of what they have said. I get the chance to see what I’ve written from another perspective. Sometimes what I see is difficult, and painful; other times it’s enlightening. Sharing what I’ve written is always scary, but I also know it’s an important part of the letting go process that gives a writer the perspective they need to move forward. Yesterday morning I was at my university’s spring semester convocation assembly, fighting sleepy thoughts, and listening to the choir sing “Total Praise”, when towards the end of the piece a soloist’s voice broke in, and completely roused me from my personal zone/stupor. I was utterly floored when I looked up and saw that the voice belonged to one of my former students. What a voice! I couldn’t believe that it came out of him, because for the two semesters that I had him in classes, he was — honestly — kind of unremarkable: quiet, and seldom participating. If he did contribute to the discussions, he never spoke loudly, or with passion, and yet there was clearly that much power inside of him. I was so moved, not just by the choir and that young man’s voice, but also by the thought of how amazing it is to be surprised by someone in that way; that inside a person there can be something so remarkable, and beautiful, and just so shocking in the best of ways, and wasn’t I privileged to witness that? It wasn’t the first time a student surprised me — in fact, I still think about P., who I had in class about ten years ago. He was kind of intimidating-looking (it didn’t help that he came to class the first day still recovering from a gunshot wound to his left arm), and had a personal history to back that up, and I wasn’t sure what to expect. Then, one day in class, he raised his hand and proceeded to contribute some incredibly insightful observations and interpretations about a piece we were reading and I was just blown away. Over the next two years that I knew him, he would drop by my office and chat and we’d talk about school, and life, and what he was reading. In the time that I knew him he never changed the way he outwardly looked: dreadlocks, sagging pants, gold chains — the works, and I often wondered how many people on the outside world would have the chance to see the P. that I knew was in there. I don’t know what he’s doing now, but I hope that whatever it is, he is surprising people right and left and making them all walk away thinking: what a privilege it was to have spoken with that young man today. I love being surprised by people — especially by the young people I work with. I love writing about that process. I hope I manage to capture that feeling of mouth-dropping amazement that happens when you are surprised to see what’s inside of someone and, in the process of discovery, you learn that much more about yourself, too. At any rate, I want to be able to do that in my writing — to take the reader on that journey. Yes, what happens in a book is always important, but who it happens to, and how that person is changed as a result — that’s what a reader remembers, long after the book is closed. People are the catalysts for change; plot is the vehicle for it to happen. What I always want to experience in the books that I read is that process of spending time with a skillfully-developed character long enough to be surprised by him, to have that thrilling moment of discovery — to feel the way I did yesterday, when I heard my student’s voice fill the gymnasium with sound. Those are the books I remember — because in changing me, they became a part of me. Back when I was in college, I wrote a novel. I called it The Lotus Eaters, and it was an odd story about a brother and sister (adults) who lived with their frail, eccentric, stray-animal-collecting mother in the Lake District in England. Their father abandoned the family when the kids were young, moved to Italy, and remarried. The siblings and the mother plod along through their humdrum, dysfunctional, insular lives until one day their step-brother turns up on their doorstep. The step-brother is a manipulative, handsome, and pretty unlikable person but, despite her best efforts, the sister falls in love with him. This destroys the brother, who is already mentally fragile, and who has an almost incestuous obsession with his sister. Anyway, none of it ends very well for anyone. I would peck away at writing The Lotus Eaters on my word processing typewriter in my dorm room. I spent two years working on it. When it was finished I was so proud of what I had done, despite the fact that the guy I was dating at that time casually commented that the title was “pretentious” (and maybe it was — I had named the book after Tennyson’s poem – good grief). But somehow, in the intervening years, the manuscript ended up in a box, shuttled between moves, across states, from apartments to houses to homes. Eventually, it came to rest in a rubbermaid bin in our crawl space. I was never happy about that fact. I pushed the book out of my mind until one day almost five years ago. I was sitting in the library, waiting for my daughter to finish leafing through a book, when I looked up at the “New Releases” shelf and saw my book on the shelf. I gasped. I felt like someone had slapped me. I snatched it off the shelf. Of course, it wasn’t MY book, but Tatjana Soli’s beautiful debut novel, by the exact same name. I almost cried. All the while I had been raising my babies, putting my writing on the back burner, dreaming my dreams about someday sitting down to write another novel, and someone had soundly, brilliantly, beaten me to it — taken my title and, along with it, my book. That’s exactly what it felt like. I fought back tears as we left the library. I felt defeated, and cheated. How could I possibly have time in my busy day to carve out even one hour to write? And, even if I did, what was the point of it, anyway? Other people got published — not busy working moms like me who needed every spare moment they had to hold it all together. 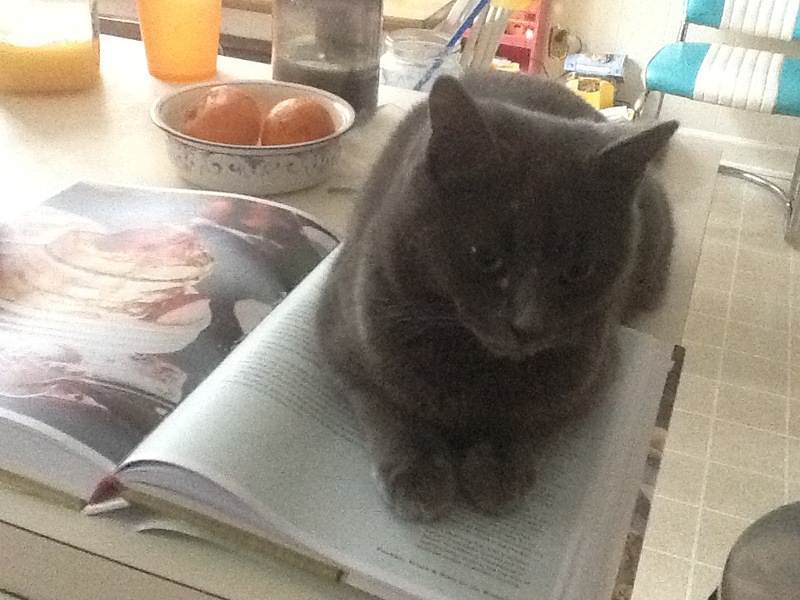 Of course, Soli did not take the title, nor did she take my book! But that moment in the library changed my writing life in big ways. I could sit around and wait for others to write their stories and send them out into the world, or I could pull myself together, stop making excuses, and make amends to my first novel by sitting down to write another. And then another. And one more, until I could get my words out there, and share a story with the world. That’s the way it is with dreams: you can do nothing but sit and dream them until they make you crazy with longing, or you can roll up your sleeves and do what you have to do to make them happen. I’m so glad I was sitting on that library bench that day, staring idly at the spines of all the books in front of me. I have been thinking about that day a lot lately, now that my wonderful and very own literary agent has sent my book out into the world on submission. I don’t know what will happen, but I like to close my eyes and imagine my book sitting on a library shelf some day, spine facing proudly out. Yesterday we took the Christmas tree down. This year, my daughter helped me, which somewhat softened the blow of dismantling Christmas. Some years I’ve done it alone, just me and some moody music, putting away all the bright things, and trying to block out the images of how exciting it was to put them up only a few weeks before. I did feel melancholy taking them down again. Not just because Christmas was over — in some ways I am okay with the holiday itself being over and done with (that sounds Grinch-like, but it’s not what I mean), but I always feel weighted down by thoughts of what the next holiday might bring. If we were all together this year, healthy and here, surrounded by the people we love (not to mention the furry family members, two of whom are elderly), what will it be like next year? What unexpected turns lie ahead? Did I cherish the here and now enough? Savor the moments? Commit enough images to memory? We were away for nearly seven days this year, and I couldn’t accomplish much of anything work-wise in that time, which is par for the course this time of the year. I can’t find good space to write at my parents’ house, and even if I could, I wouldn’t want to. I spent the days soaking up my niece and two nephews, and spending time with my sister, who was in Rome for a few months this fall, and time with my brother, who I always feel I never get enough time with as it is, also running errands with my dad (and catching up with him in the process), and helping my mom in the kitchen. I did get some good runs in, past old haunts of my childhood and college years – including a rain-soaked run along a path where I used to walk our family dog. The highlight run of the trip was a short three-mile run (round trip) to my sister’s new house, where I got to stop and hug my nephew, still in his Christmas jammies. Christmas day my husband and I took a walk together, up to the campus of the University of Maryland, and to the chapel where we got married nearly 19 years ago. We walked up the steps, and I looked out at the same view I had looked out on all those years ago, when the ceremony was over, and we stepped through the chapel doors together, and down the front steps and into our future. This time, instead of a white dress, I was wearing ridiculously awesome green knee socks with the word “VEGAN” printed down the sides. Standing at the top of the chapel’s steps, that crazy sprawl of college-town in front of us, I was acutely aware of how far we’ve come on this journey, yet how the same I really am, and my husband still is, deep down inside. A lot has changed; quite a bit has stayed the same. There’s nothing quite like the perspective you get when you retrace steps back to some starting point, and assess the roads that took you there. Then, we walked back down the steps again, hand in hand, and into the spread of years that lie ahead, filled as they will be, I am sure, with successes, and joys and glorious experiences; bittersweet partings, heartbreaks, losses, and all that goes into the unbearable lightness (to borrow from Milan Kundera) of living and loving. That walk — I think that was the best gift I got this year. 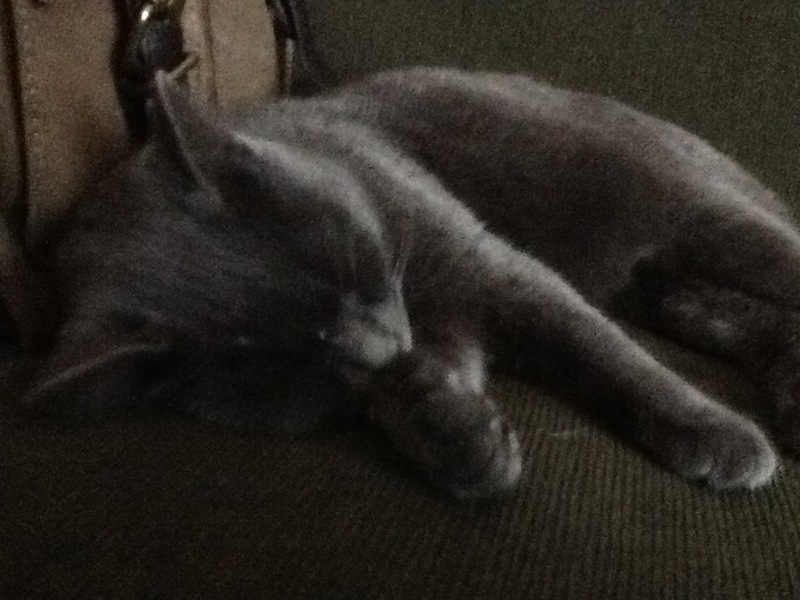 Plus: New kitten cuteness! The kids and I have been badgering my husband for months now to add a kitten into the mix. His name is Benjamin (Benny for short). He’s estimated to be about 5 months old, and he’s a sweet charmer — easygoing and social as can be. We followed strict rules mined from the internet on how to introduce a new kitty to the resident cat and I must say we’ve met with success! While they are not BFFs yet, they are co-habiting nicely together — we even caught them touching noses a couple of times. It’s been awhile since I checked in here — this semester has been some kind of crazy, and it caught up with me big time right before Thanksgiving, when I came down with bronchitis. This is not unusual for me. Every year I get felled by respiratory crud, and it’s almost always perfectly timed to coincide with the holidays, like my body just goes and goes and goes and then, because it knows a break is coming, everything crashes. It’s hard to believe that a month ago I ran a 1/2 marathon, because I’ve only managed to slog a few miles a few times a week for about two weeks now. Blech. I feel horribly out-of-shape, even though I’ve still been running. I try and remind myself that this is temporary. I realize now, of course, that teaching six classes on top of other responsibilities was too much. Next semester I’m slated to teach five, but that may drop to four, which would be glorious. This has been a roller coaster semester, but it’s ended with a few bright spots: Today I sent off my revisions to my agent — cue a big exhale on that one, even if the accomplishment comes with healthy helping of nerves. Yesterday one of my students came in to talk to me about her creative writing! She’s a senior, and wants to go into script-writing. A colleague told her I would be a good person to talk to, so I was happy that she came by and we had a great conversation about writing, querying, revising, the future of certain genres, etc. Today, a student who I was disappointed in because he plagiarized his final paper, came by to apologize and explain himself. I always respect that — when a student shows the maturity to confront what they did. Another student thanked me for my work this semester, and asked about what classes I’ll be teaching in the spring. There have been so many disillusioning, sad, and downright shameful things happening out in the world that touch the community where I work. I look at the young people I am surrounded by every day and I am thankful for each one of them. This time of the semester is usually all about measuring what I’ve taught my students; what they have learned over these past 15 or 16 weeks, and how they might apply it in their lives. But I am aware now, even more than usual, how much I have learned from them instead. Blogging saved my writing self. I started a blog back in 2004, when my son was four years old, and my daughter only a few months old. I don’t know why I started blogging. I had been following other people’s blogs for some time, and reading about what other women were going through — how they were juggling mothering and everything else life threw at them at once — those stories inspired me, and made feel less alone. We hadn’t been in North Carolina long at that point, and I was still feeling so cut-off, and like a fish out of water; Raleigh just wasn’t fitting me the way life in upstate New York had fit. I craved the voices of other writer-mothers, and the more I read the more I thought: let me do this. I can do this. I needed to throw a rope out to myself, because at that point in my life, there were times when I really felt I was drowning. I told myself that keeping a blog would hold me accountable. I would write often, and in doing so perhaps my writing muscle would become more defined again — the way it had been back when I was in graduate school. It worked. I loved my blog — World of One Thousand Different Things — and I built up a wonderful readership and so valued being a part of that community. After I got my job as a paid blogger for The Family Education Network I shut down my blog, and let it go. I was busy having to write a post/day five days/week for Family Education, and that took up all my creative juices. A few months ago I tried to find my old blog, but I used the Blogger platform and I can’t seem to find my way back in again. It’s sad: to think about my words floating out there in some nowhere land, but there’s nothing I can do about that now. All this to say that this is why I have gone back in and renamed this blog — as a nod to my other one, the one that started it all. I don’t need the rope anymore, but I still remember what it felt like to grab a hold of it. I can’t believe it’s the middle of November already. I wanted to do NaNoWriMo this year and see if I could get some momentum going on a WIP I’ve been stopping and starting, but I’ve been so engrossed in absorbing and tackling my agent’s seven-page revision letter that I haven’t been able to produce anything new. I can say I’ve been participating faithfully in NaNoRevMo — National Novel Revision Month, and I wish there were some kind of badge for that I could stick on my Facebook page. The beginning of the month started off badly — my former critique partner kindly told me she was too busy to take a look at my MS this go around, and I was feeling decidedly unmoored and alone. I was in a funk about What To Do about the revisions and I was feeling dry on ideas. I thought: this is it, I’m done with ideas — it’s over. But then I talked with my agent on the phone, and something she said percolated in my brain for two days. I went out for a run that same day and suddenly it came to me: An Idea! A Great Idea! I couldn’t wait to begin writing. Now I am coming up for air, and I feel good. For the most part. I am still having occasional imposter-based anxiety dreams at night where my agent is telling me that she made a mistake, and that she won’t be able to sell my novel for me after all. It’s crap. But I am plugging away. The best way to shut up that voice in my head, the one that likes to needle me with self-doubt, is to keep working. My rough revisions are in the hands of two shiny, new CPs (well, one is a dear writer friend who read my first MS a few years ago), and I am moving on to Stage Two (or Three?) of my own personal revision process: reading through the hard copy and starting hard copy revisions. Those are a very different beast from the other kind, when I am actively writing and taking the glimmering ideas in my head and turning them into words. When I am writing those kinds of ideas I am convinced they are The Best Ideas Ever and I am doing brilliant work! Hard copy revisions can be scary, because that’s when I look at what I’ve written and brace myself for the doubts — confronting words on a page that you hold in your hand, that can be frightening. But that’s an important part of revising, as well. I think the revision process should be scary, because if it’s not — well, maybe there’s not enough at stake. 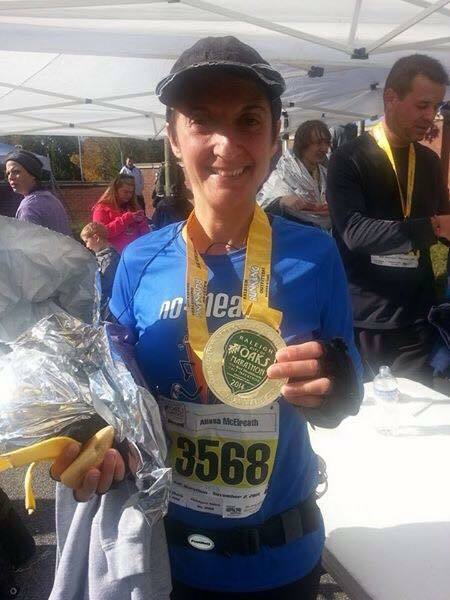 In running news…I ran my second 1/2 marathon on November 2nd! I had been looking forward to 13.1 miles in which to contemplate my novel and my revisions, but I don’t think I thought about my book much, which was strange. I think I needed the mental break. I thought about lots of other things. I thought about my kids, and work, and my husband, and the holidays, but mainly I gave myself over to the work my body was doing. I soaked in the sights of downtown Raleigh, and I felt a surge of pride when I caught sight of the city skyline, or when I ran past the historic buildings downtown. I don’t often feel that sense of pride and belonging in Raleigh, but I did that day. I felt good during the race, and finished 12 minutes faster than last year. It’s funny — I didn’t doubt I would finish, and I didn’t doubt I would be faster. I don’t know why I can’t cultivate that same confidence in my writing. One year older, I thought when I crossed the finish line, but a little faster (is running the only thing that works that way?). Training pays off — that’s what I tell myself when I revise now, too. Revisions are a chance to hone and train the craft. The more I do, the better I get. P.S. My hat is embarrassing — it’s my lucky running hat, but it looks like it might need to be retired. Because there is unanimous consensus out there in the writing world that the only antidote for the waiting game surrounding all things publishing is writing and more writing, I am slowly but surely beginning another book. I have a loose sense of the story arc, and of three of the main characters, and some unformed “scenes” bouncing around in my head. I am planning on trying to be more of a “plotter” rather than a “pantser” this go-around, but we’ll see if I can pull that off. Back in August I downloaded Scrivener onto my laptop with some birthday money, so maybe that will help with the “plotter” end of things. I always start a book with a sense of where I want it to go — the book in its entirety hovers in my head, all shadowy and unformed, and it’s always so gratifying to watch it take on shape as I write. But I know there are parts of my craft that could use some work, and one of these areas is to be more deliberate about how I plan out the novel at the start, rather than just plunging in. I’d also like to take more risks. When I was in graduate school for my MA in creative writing, the wise poet Ruth Stone** told me after a workshop one day not to be afraid to let the edges show in my writing. I think she meant that everything doesn’t have to be neatly wrapped up; that a dose of the raw, and a glimpse of the ragged edges of life, of experience, and people, can be powerful things in writing. I have tried to take her words to heart, because I know that I like the ends to connect in my own life. So as I prepare to immerse myself in another writing project, I am giving myself pep talks: take risks, expose rawness, be fearless. the hind legs dragging flat. you called the Humane Society. They came with a net and went for him. their truck ominous, with a cage. you saw his eyes. He understood. After they took him, you began to suffer regret. scrambling to reach the others. is going too fast; your hands sweat.